The family of human heterodimeric integrin receptors consists of 24 members, which differ from each other in α and β subunits. Eight integrins of this superfamily (αvß1, αvß3, αvß5, avß6, αvß8, α5ß1, α8ß1 and αIIbß3) are able to recognize the RGD tripeptide fragment in natural and artificial ligands with various activity and selectivity. avß6 is usually undetectable in normal adults’ cells, but is highly upregulated in different types of cancer (including pancreatic, breast, skin, head and neck, lung (NSCLC) and ovarian cancer) and exclusively expressed on epithelial cells. 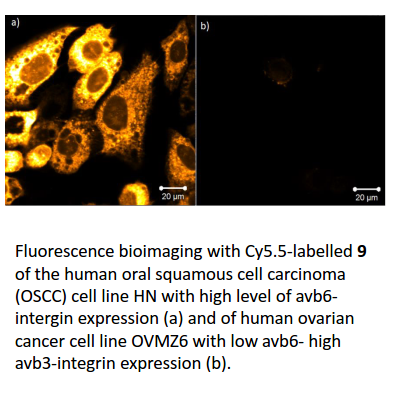 Therefore, avß6 is an emerging target for therapy as well as imaging across several common tumor types. Only few ligands are known so far that are highly active for avß6 integrin and at the same time possess no binding afﬁnity toward other RGD-recognizing integrins. Unfortunately, their metabolic instability, their high molecular weight and the complexity of their structures limit their medical application. Having regard to this situation, there is a need for novel functionalized or non-functionalized avß6-ligands that can be used as drugs or as tools for molecular imaging and diagnosis (PET/SPECT/UV-Vis tracers), for coating of medicinal relevant surfaces or for biophysical investigations of the function of this integrin subtype. Surprisingly, peptides with a remarkable affinity for avß6 and at the same time high selectivity against other integrins have been found.